Drepung Loseling Monastery Residency, a set on Flickr. This week the monks of the Drepung Loseling Monastery have been educating and enlightening the Dominican University community with the mystical arts of Tibet. The Rebecca Crown Library is honored to host the site for painting a sand mandala. The painting will take place through Sunday February 19. The closing ceremony will be at 2 PM. 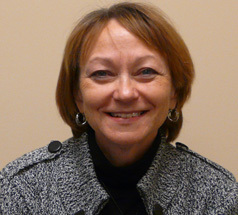 Felice Maciejewski (pronounced ma-chee-ef-ski) is the new University Librarian. She was born and raised in Wisconsin. She holds an MA in Library and Information Studies from the University of Wisconsin-Madison and a BA in Italian from the University of Wisconsin-Milwaukee. Felice lived and studied in Heredia, Costa Rica and Bologna, Italy. Felice got her start in libraries working as a student assistant “shifter” and held several staff positions at Memorial Library and the Middleton Medical Library at UW-Madison. Her first professional librarian position was the Circulation Librarian at Purdue University. She worked at Tulane University in New Orleans for fourteen years, first as Circulation Librarian and then as Head of Access Services. She left New Orleans just in the nick of time, two weeks prior to Hurricane Katrina, to take the library directorship at St. Norbert College in De Pere, Wisconsin. There she oversaw the planning, construction, and move to the state-of-the art Mulva Library. She is active in the American Library Association. Felice has two beautiful daughters, Ariela and Leah, two son-in-laws both named Brian, and one dog, Phoebe Buffet. She is an avid collector of nativity sets from around the world, 160 and counting. She enjoys traveling, reading, and gardening. She is excited to be here at Dominican and is looking forward to meeting everyone in the Dominican Community.